In the vast majority of cases medical treatment is carried out very competently. However, accidents do happen, and when an accident is attributed to a medical mistake and you have been injured as a result then a claim for compensation – a Medical Negligence claim (sometimes known as a Clinical Negligence claim) – may be possible. To help you understand whether a claim may be possible and to explain the steps in the process the Clinical Negligence team at TSP have put together a comprehensive guide to Medical Negligence claims. 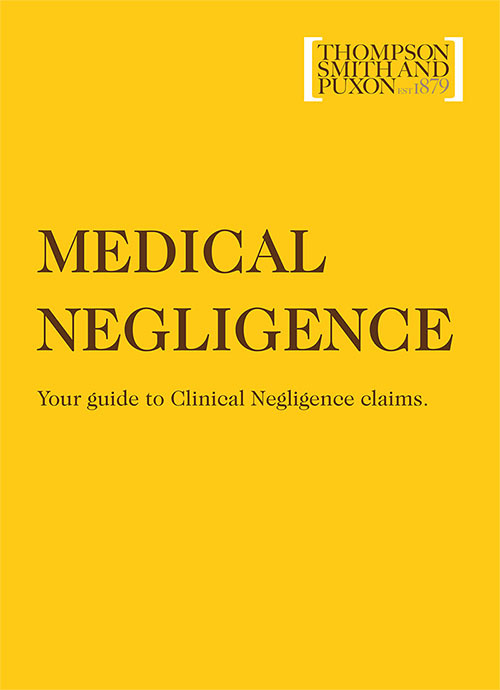 In the guide you will find detailed information about the different types of Medical Negligence claim and what to do if you believe you or a family member have been a victim of Medical Negligence. The guide also provides useful information about the steps in the Claim Process and the different funding options available. To download the guide as a PDF, please click here. If you would prefer to have a hard copy sent to you, please fill in your details here and we will arrange for one to be sent to you.